Click here for The 4iiii Manual. Extend your battery life up 100 hours with the latest Firmware upgrade. 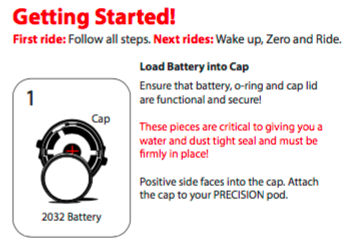 We’ve also made improvements that make allowance for general sensor vibration so you no longer have to remove your battery when transporting your bike. 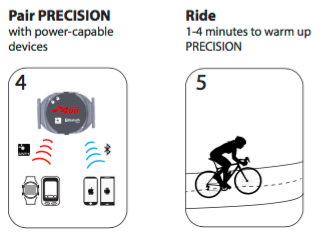 Now you will be able to see how much battery life you have left when you’re out on a ride. This battery alert will be transmitted to the 4iiii app as well as any ANT+ head unit paired with the PRECISION power meter. The percentage of remaining battery will tick down according to your sensor use. When your battery status shows as “low” status, you have about 20 more hours before it’s time to finish your ride and change out the 2032 battery coin. For best results, use one battery until it reaches the ‘low’ mark and then replace with a new battery. 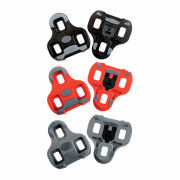 PRECISION’s new advanced settings allow you to adjust PRECISION’s output to account for a leg strength imbalance. 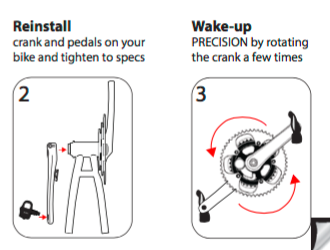 It will also let you match PRECISION’s output to that of another power meter. This feature was introduced to address the fact that PRECISION is (currently) a left-only power meter, and not everybody has a 50/50 left-right balance. Perhaps from training on some different equipment, you know that your left leg is actually weaker and you have a 45/55 left-right balance. Doubling the power from your left leg (as per PRECISION and all single sided power meters), gives you a total power of only 90% of what you’re actually putting out. In order to adjust for this, you can simply set the scale factor to 50/45=1.11111. 50 because 50% is your desired reading for PRECISION (half of your total power output), and 45 because your left leg is actually only putting out 45% of your actual total power. This scale factor can also be used to match PRECISION’s output to other training equipment you use. These changes allow for robust and reliable handling of calibration values, providing accurate reading (+/- 1%). PRECISION’s seamless connection to Sportiiiii and ANT+ compatible displays (watches, bike computers, etc.) lets you work with your choice of top devices from leading global brands. Let all your 4iiii products help you optimize your performance. 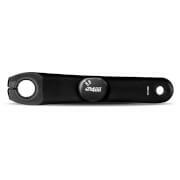 Use your PRECISION power meter with your 4iiii Sportiiii heads-up performance coach, which gives real-time visual and audio coaching cues. Wear your Viiiiva heart rate monitor along with PRECISION for ultra-responsive beat-to-beat measurements that can help you adjust your performance. 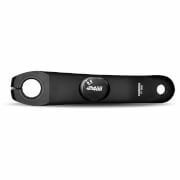 Android: This product is designed for use with Android devices compliant with the Bluetooth 4.0 protocol running Android version 4.3 or newer and must allow Third Party App Access to the Bluetooth 4.0 (Smart) Radio. View your activity in real-time, upgrade to our latest product features and access the 4iiii web store with the 4iiii app. It’s compatible with both iOS and Android and is your gateway to emailing your stored activity logs to your favourite third-party training app or site. Click here for iOS instructions. Requires iOS 7.1 or later. Compatible with iPhone 4S, iPhone 5, iPhone 5c, iPhone 5s, iPhone 6, iPhone 6 Plus, iPhone 6s, iPhone 6s Plus, iPad Wi-Fi (3rd generation), iPad Wi-Fi + Cellular (3rd generation), iPad Wi-Fi (4th generation), iPad Wi-Fi + Cellular (4th generation), iPad mini Wi-Fi, iPad mini Wi-Fi + Cellular, iPad Air, iPad Air Wi-Fi + Cellular, iPad mini 2, iPad mini 2 Wi-Fi + Cellular, iPad Air 2, iPad Air 2 Wi-Fi + Cellular, iPad mini 3, iPad mini 3 Wi-Fi + Cellular, iPad mini 4, iPad mini 4 Wi-Fi + Cellular, iPad Pro, iPad Pro Wi-Fi + Cellular, and iPod touch. Requires Android 4.3 or better, and Bluetooth 4.0 support on the phone. We have seen better BLE stability with Android 4.4 and Google Nexus devices. We have tested with Nexus 5, Samsung Galaxy S4, Note 3, and Note Pro (tablet). Older phones have been less stable, especially for firmware updates.